As you launch web application security scans in Netsparker, you can configure the scan settings manually. But, since many scans are necessary, it would be inefficient to manually configure the same settings each time. 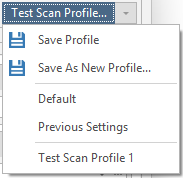 Scan Profiles enable you to save scan settings for future scans. Scan Profiles can be reconfigured at any time. Scan Profiles apply only to single website scans. They cannot be used for group or multiple website scans. In Netsparker Enterprise, configuring scan profiles is achieved through fields that are mostly the same for all scan types – full or incremental, single or group, immediate or scheduled. From the dropdown next to the Target URL field, click the gears icon ( ) . Click Save. The Save Scan Profile dialog is displayed. 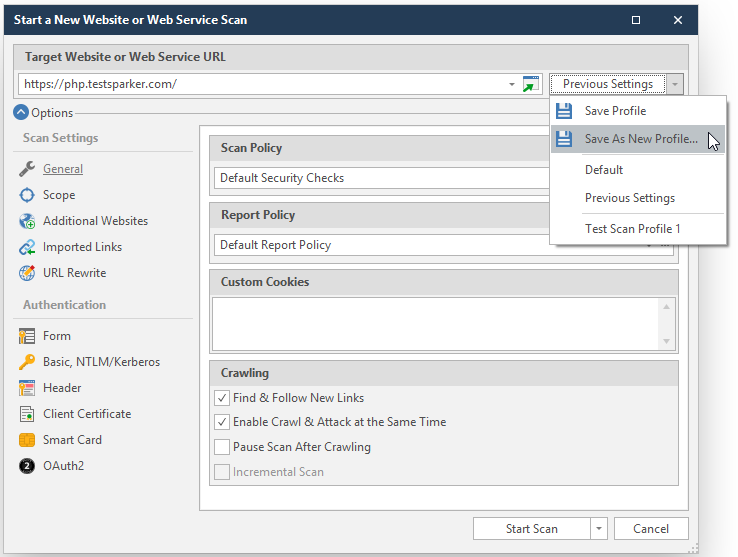 Enable Primary if you want to set the Scan Profile as the default for the specified website. Enable Shared if you want to share the Scan Profile with your team. Click Save As New Profile. From the dropdown to the left of the gears icon, select the relevant Scan Profile. Configure the scan settings as required. Click the gears icon ( ) and select Save. The Save Scan Profile dialog is displayed. 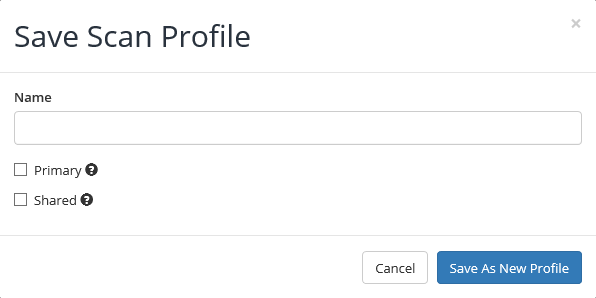 Complete the fields as explained in How to Create a Scan Profile from Scan Settings. From the dropdown to the left of the gears icon ( ), select the relevant Scan Profile. Click Delete. The Delete Scan Profile dialog is displayed. 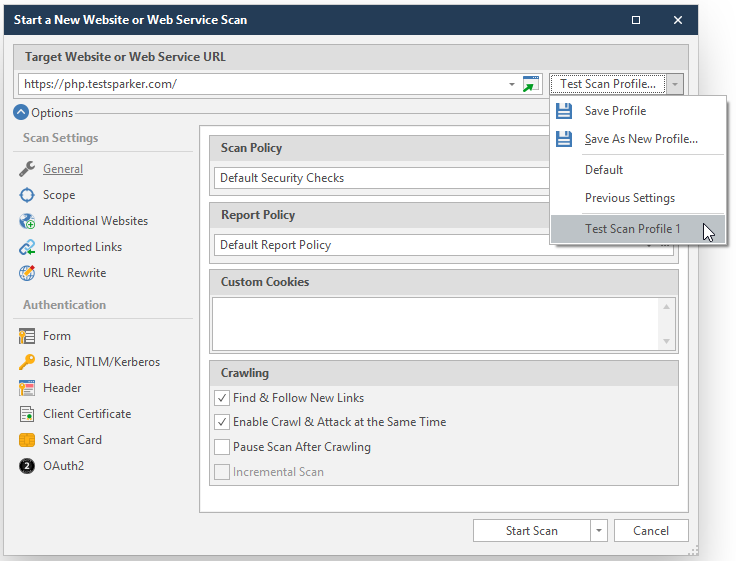 In Netsparker Standard, when you configure scan settings in the Start a New Website Scan dialog, the tab in which the changes are made is marked as bold and underlined for reference (e.g. General). This is also useful when you load a Scan Profile. You can quickly see which tabs contain settings that have been modified. From the ribbon, click Home, then New. 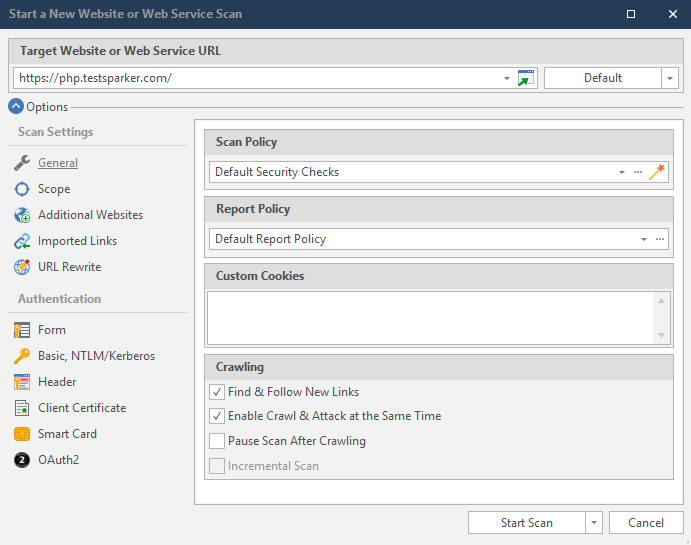 The Start a New Website or New Service Scan dialog is displayed. In the Target Website or Web Service URL panel, click Previous Settings. Click Save as New Profile. The Save Profile As dialog is displayed. In the Profile Name field, enter a name, and click Save. 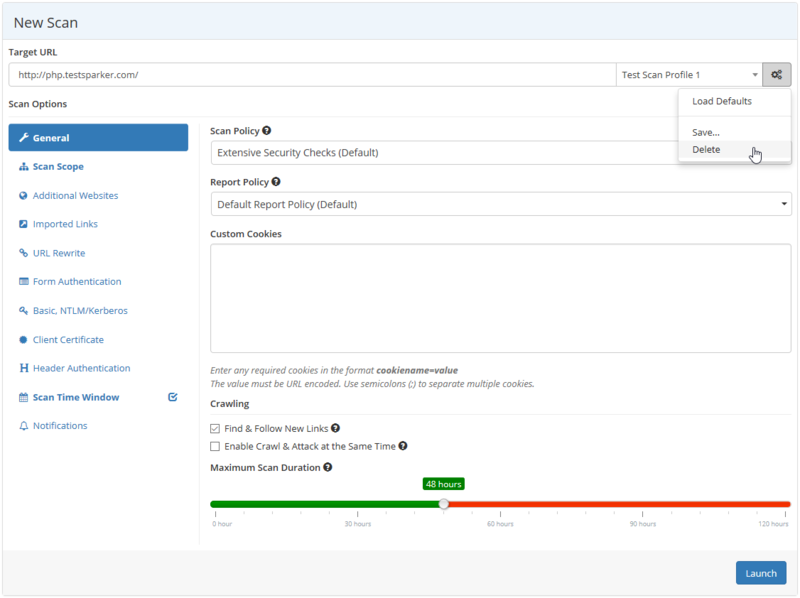 Log in to Netsparker Standard. From the Target Website or Web Service URL panel, click Previous Settings. Select the Scan Profile you want to use. From the button dropdown, click the downward arrow, and click Start Scan. 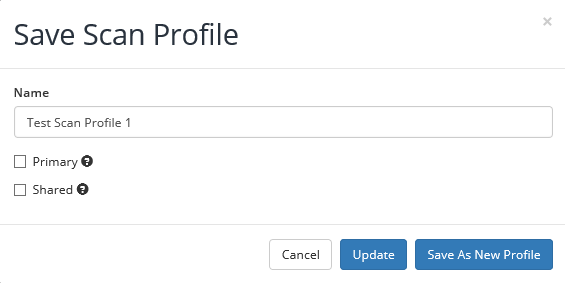 Select the name of the Scan Profile you want to change. From the Previous Settings dropdown, click Save Profile. 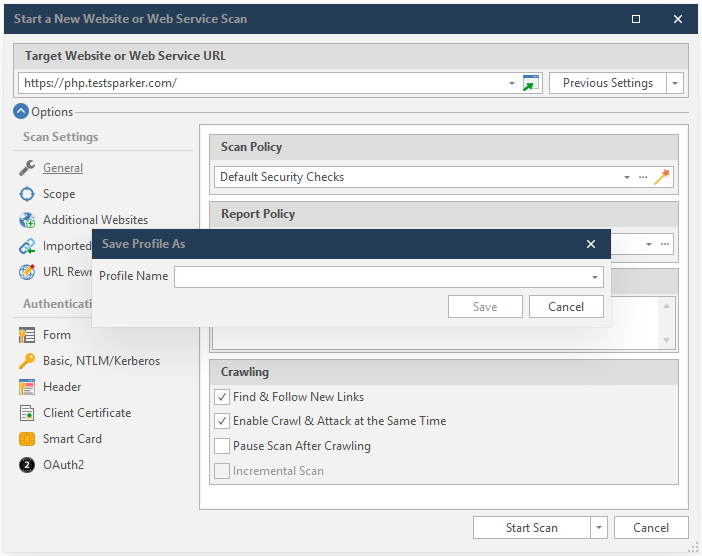 The Netsparker Standard web security scanner has two built-in Scan Profiles, the Default and the Previous Settings. The Default Scan Profile has the default configuration. The Previous Settings built-in Scan Profile is used by the scanner to save the settings of the Scan Profile used in the previous scan. Even if you used a saved Scan Profile in a previous scan, its settings will be saved in the Previous Setting Scan Profile.